Shaun Ren and his son Sam, who needs special care from Sunflower Care Services. THE State Government may shut off vital respite services to Nedlands cerebral palsy sufferer Sam Ren (30) if a contentious Disability Services Commission contract with Sunflower Care Services is not reinstated after November 30. 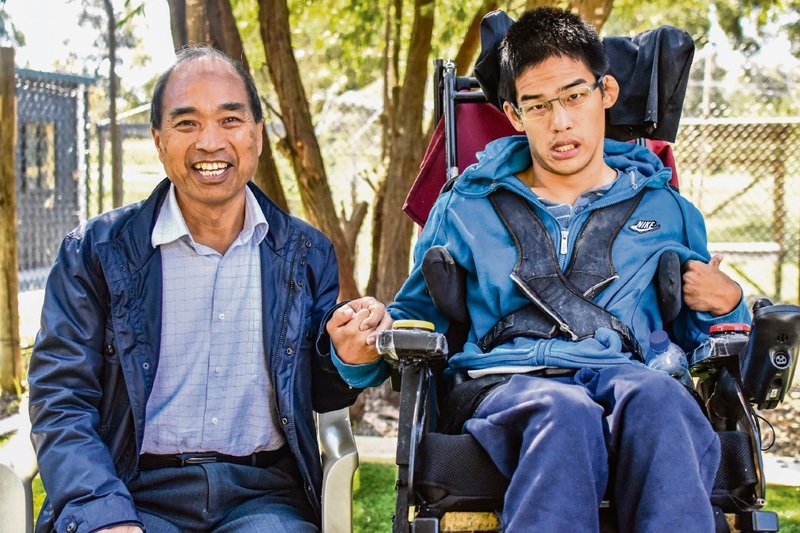 “He has been to several places for respite, there’s not that many and there’s generally not shortage of these types of facilities,” Sam’s father Shaun Ren told the Western Suburbs Weekly. The Ren family, and those of about 40 Sunflower clients across Perth, has faced about six months of uncertainty since it became apparent, without explanation, that the northern suburbs-based carer would not have its contact renewed. Mr Ren said the three days each week his son spent at Sunflower were important because the family could not provide homecare “seven days a week, 24 hours a day”. He said an alternative carer would be difficult to find. “We have to look for other places, but the problem is they all say they don’t have any places,” Mr Ren said. Sam has been going to Sunflower since it opened during a respite shortage several years ago. Long and short term care of the severely intellectual disabled, and those with serious medical conditions, is provided at six homes in Marangaroo, Carabooda and Wanneroo. A Sunflower spokeswoman said respite users faced an uncertain future with limited options for new accommodation. Supporters of Sunshine Care Services protested against the pending end of an extended contract at Parliament House yesterday . Disability Services Commission (DSC) director general Ron Chalmers said Sunflower’s initial 11-month contract allowed the provider to “prove itself”, but it expired on June 30. Mr Chalmers said it was not renewed because “serious concerns” were held about the quality of services, based on complaints and an independent review of the organisation’s operations. He said two short-term contracts subsequently offered so clients could get new providers were refused by Sunflower. Families affected were contacted directly about the initial contract’s cancellation in July, and 24 had already moved to another provider. In a statement, Sunflower owners Joseph and Katherine Karunarathna said they were not aware of any legal action linked to the contract, and rejected the complaints they said were from one employee. “If the DSC has any further concerns, we request that they raise them with us so we can work together to resolve them and ensure our clients can continue in our care to receive a service they are satisfied with,” the statement said.